Nashville's Country Music Hits: All The Cooks In The Kitchen : The Record Songwriters, song pushers and publishers all have a hand in taking a song from an idea to the radio. 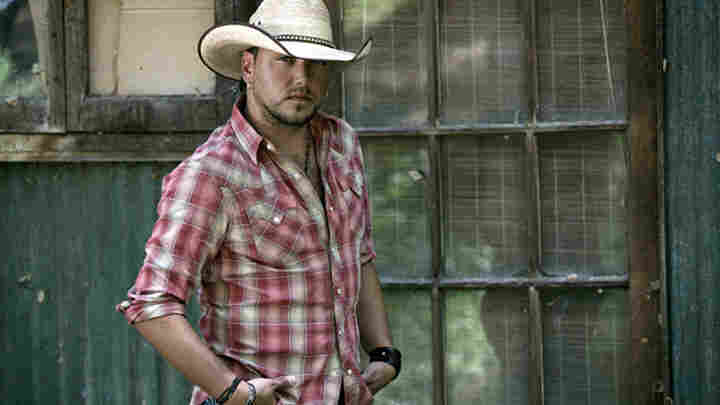 Jason Aldean, who sings the version of "I Ain't Ready To Quit" that you can hear on the radio. In pop music nowadays, hit songs generally begin in the recording studio, where teams of producers and composers build tracks with a performer for a specific album. Professional songwriters, like those who used to work in offices in New York's Brill Building, are largely a thing of the past. Not so in Nashville, where most hits begin in small rooms and offices with just some guitars or a piano. Music Row's songwriters are the first step in a song's journey to a place on somebody's album and perhaps the radio. At one end of Music Row, the ASCAP and BMI buildings stand like twin guardians of the art and business going on up and down 16th and 17th Avenues. They are the performing rights organizations that help songwriters and publishers get paid for radio, TV and live performances of songs. In his ground-floor office at BMI, Vice President for Writer/Publisher Relations Jody Williams explains why Nashville is the last bastion of a hit-making system built on the primacy of the song. "We're on this kind of college campus here on Music Row," Williams says. "Where it's about ten blocks by three blocks. Probably 300 songwriters a day wake up and walk into offices on this campus at different publishing companies, make coffee and they see what falls out of the air, through their heads and their pens." Just two blocks away from Williams at Bug Music, a global publisher, staff songwriter Jaron Boyer works on a new melody with co-writer Lynn Wilbanks. After five years in the business, Boyer is still looking for his first hit song. "I wrote I think 140 songs last year," says Boyer. "And you know, more than half was just me playing around, just mouthing stuff and I'm saying something and someone will be like, 'Yeah! That's awesome!' And that would be the hook or that would just click everything." Where solo writers like Harlan Howard, Kris Kristofferson and Mel Tillis once dominated the system, today's Music Row has become a haven for co-writing. These ever-shifting combinations of two and three or more writers come together through personal relationships, Music Row politics and a collaborative effort that can get past blocks and help finish a song by quitting time. When a song is done, the writers gather around a digital recorder or laptop and make what's called a work tape, like the one for a song called "I Ain't Ready to Quit" that Jaron Boyer made with co-writers Ben Stennis and Thomas Rhett Akins. Work Tape -- "I Ain't Ready To Quit"
If the publishers of the various writers agree the song is worth pitching to artists, they book studio time and musicians to make a demo recording. Demo Recording -- "I Ain't Ready To Quit"
And at some point between the composing and the demo, strategy kicks in. "People are always thinking about matching songs with so-and-so," says Tom Douglas, one of the top writers in Music City. He landed his first Number One hit in 1994 and had three in just the past year and a half. He reads the RowFax, a tip sheet that covers which artists are looking for new material. Douglas says as songwriters are writing songs, they're thinking in the backs of their minds that a song would be good for anyone from Carrie Underwood to George Strait, or, in the case of "I Ain't Ready To Quit," hot newcomer Jason Aldean. Album version -- "I Ain't Ready To Quit"
This was the first time that Boyer, Stennis and Akins have landed a cut on a major country star's album, a career landmark. 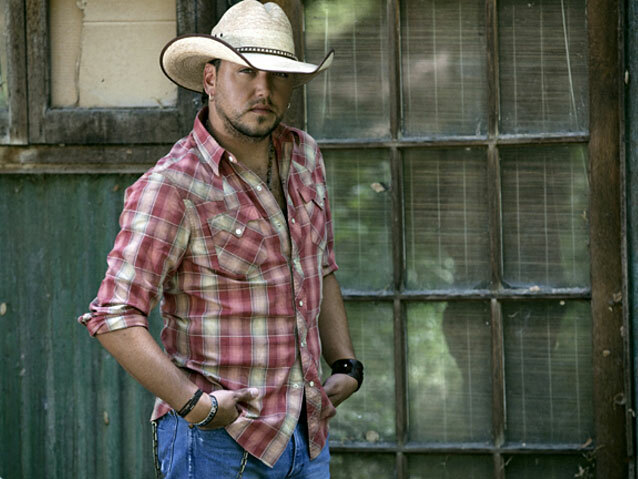 Some believe Aldean is on track to sell a million copies of his new CD, My Kinda Party, which would generate about $100,000 in royalties for the song. Split among three writers and their publishers, that's a rather modest payday. For radio hits the math is better. A big song can be played hundreds of times on a radio station. Multiply that by 2,000 country stations, and airplay can generate upwards of $1 million for a single song. Natalie Hemby co-wrote the song "White Liar" with Miranda Lambert, the artist who made it a chart-topping, award-winning single and hit video. "And we wrote it in 30 minutes," she says. "All I did was tell her, like, 'I've had this song idea forever called "White Liar," and I don't know if you...' And she immediately -- it's like a light went off. 'Oh my gosh! White Liar! Like, the truth comes out a little at a time.' I'm like, 'YES.' And we sat down and started playing." It was Hemby's first hit song, made easier by the good fortune of landing a writing appointment directly with the artist herself. Most songs do not have a singer attached from conception. They become the responsibility of Nashville's song pluggers, like veteran Scott Paschall. "Back in the day it was a guy with a guitar singing songs from his catalog to people," Paschall says. Today it's files on a computer. One recent afternoon, Paschall and his partner Matt Lindsey cued up songs for Steve Bloch, an A&R consultant screening material for the creative director of a Nashville label. Lindsey says in his career, he's plugged for publishers, song catalogs and individual songwriters, including Garth Brooks' early smash "The Dance." "We meet with record producers, A&R people, artists themselves, the managers, the bus driver," says Lindsey. "Anybody we can get the song to to get it heard. Because you never know who's going to get the song cut." This system is a way of life in Nashville, but it is under pressure. Shorter radio playlists and the collapse in CD sales have made lucrative hits scarcer than ever. The city's top songwriting association estimates there are only about a quarter as many staff writers on Music Row today as there were a decade ago. Lindsey has days when he worries about the future. But he also says that it's never been easy. "We get turned down nine times out of ten," Lindsey says, "but you've got to have faith and you gotta keep pitching those same songs over and over if you really believe in them. That's what it really takes. I have songs I've been pitching 20 years that I know in my heart are hit songs. If the public could just hear it, it would resonate with them and be a number one smash."